Somehow, I've never had a Gobblerito. Sticking an entire Thanksgiving dinner in a burrito seems counter-intuitive, but I have to admit it was delicious. As you can see from the picture, this thing is a real beast. My dining companion did not finish her Gobblerito. 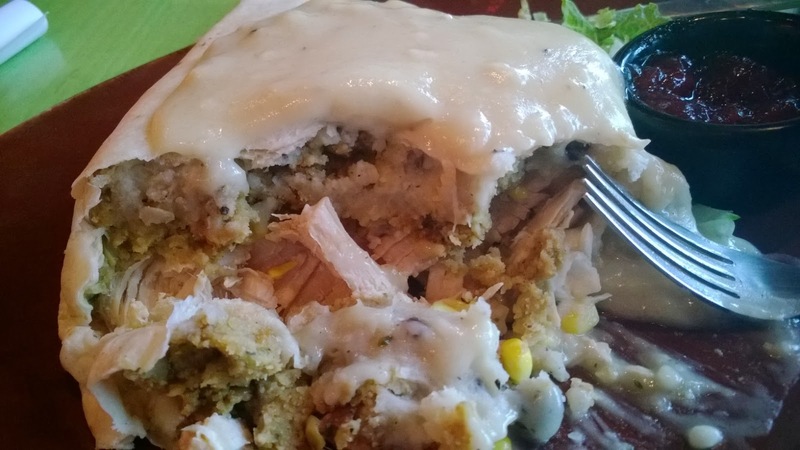 The Mad Mex Gobblerito consists of turkey, mashed potatoes, corn, stuffing and a fine slathering of gravy. They also serve some mediocre cranberry sauce on the side! I enjoyed the presentation and I felt that the ingredients were well proportioned. Personally, I would have enjoyed less potatoes, but I also seem to be the guy who has the least potatoes on his Thanksgiving plate. I'm sure others would find the proportions appropriate. Based on some very brief internet research, it appears that these things are only available in Pittsburgh. This does not shock me as we are a very fat city obsessed with portion size. 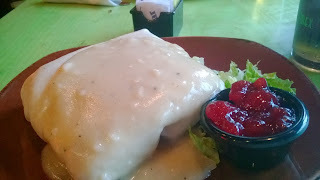 Urbandictionary.com credits Mad Mex with the creation of the Gobblerito and also offers this secondary definition for the term. "Gobblerito" The action of jizzing into a borritto before tricking your friend into eating it. Example: Mr. Feeny pissed me off so I gave him a Gobblerito. Well, that sounds neat. Thanks Urbandictionary. This is how much of the Gobblerito I was able to consume before I was full. However, I went on to house the entire thing. Two hours later, it would be an understatement to say that I had buyer's remorse. According to the Pittsburgh Post-Gazette, this concoction was invented by Mad Mex's Kitchen Manager, Matt Glick. Here's to you Mr. Glick, thanks for the diabetes!